Great email concept but has a few bugs to work out. 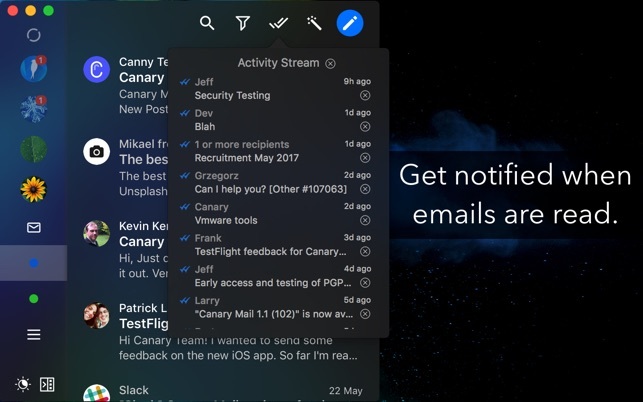 So far I absolutlely love the Canary Mail concept. 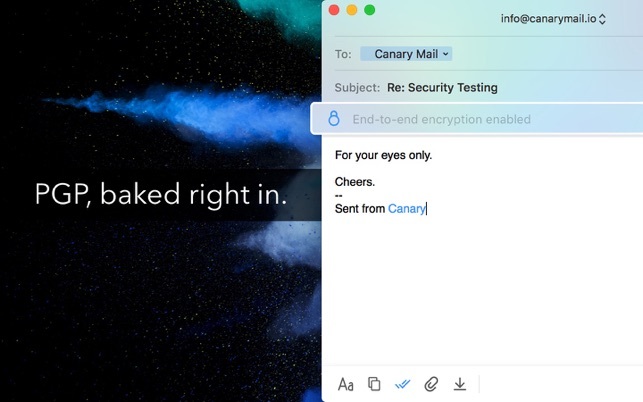 The email tracking was my leading reason to switch to Canary versus Apple Mail or Outlook. But when sending an email to multiple recipients it only shows when the first time the email is opened. It doesn’t show who opened it. That is frustrating as I need to know when both or multiple people open the email. A future feature I’d like to see is not just when they first open it but how many times they open it before responding. As far as bugs some email accounts show unread messages but when I go through all of the emails in that account there is not a single email unread. If I try to filter the inbox for unread it shows nothing yet next to the account it shows 3 unread emails. If I go to my actual email account via a browser there isn’t an email that is unread. Another feature missing is a junk folder for each email account. It is only available for the Unified email viewing. I have to go to my browser to login to the individual email accounts to see my junk mail under each one. If some of this was addressed I would totally have given the app 5 stars and wouldn’t call it a concept. This applications looked great to me and I was enjoying using it. However, after about 2 months, when retrieving older email messages, the app finds the email but never displays the contents. The spinning cog just goes on forever. If you need help with a problem good luck. If you are lucky enough to have a question that they have posted then you will get whatever information they have provided. However, if not, there is no mechanism that I have found to contact support. You will be in the dark. I am going back to Apple Mail to get the information I need. I have been doing this more and more so at this point, I should just go back to Apple Mail. Bottom line, nice product but has serious issues with no recourse to fix them. I have found that sometimes if I double click on the email the contents will appear - inconsistently. Just updating this post. Canary did get back to me with a request to send them further information. It took them about I found a feedback form by accident. However, no resolution to my problems yet. Also, I have started noticing that attachments are missing in Canary while they are visible in Apple Mail. Bugs. Fundamental bugs. And support is a once every other day email. email is critical for me and this app is not reliable. 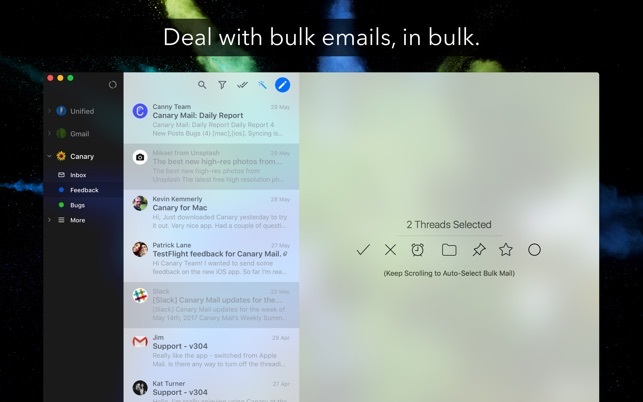 Canary Mail is a really good application and let me be clear, I am *really* picky with email apps. There are some fantastic features here but the first thing that stands out is the clean UI and design. The “beautify message text” option i.e. reformatting incoming messages works better than it sounds and as a result, emails look great. I like that fonts can be customized for outgoing email and that there are plenty of bells and whistles for compisition. Coming to the flagship feature, the track-email option is great - it’s the pro-user email feature you never knew you wanted. There are still some concerns here as mentioned in other reviews where you don’t know who opened a multi-recipient email first etc. but it functions well on the whole. Finally, snooze and ‘to-do/pin’ option assist with inbox-zero whereas ‘follow-up’ is a nice feature for reminding you to follow-up on sent emails. Canary Mail is stable most of the time although it can get a little buggy from time to time. 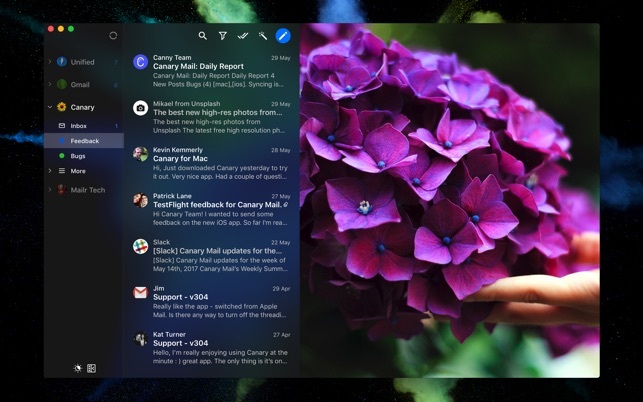 All in all, this is a really good application and is worth the $$$; it works better than Airmail for me, and has jumped right to the top of the email app chain!